Did you ever wonder how this crazy but very profitable video game industry even got started in the first place? Before Atari made their big splash in the gaming industry with their popular Atari 2600 or even their Pong arcade unit, there was the revolutionry Magnavox Odyssey. 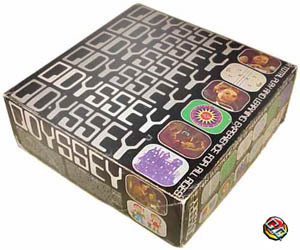 For those of you who don't know what the Odyssey was; it was the first ever real home video game system and a very important piece of video game history. Released in 1972, (yes, we're going way back here) the revolutionary Odyssey was released to the masses for about $100 dollars US. The idea of the system was the brain child of the father of video games himself; Ralph Baer. He was the first person to believe that video gaming or interactive TV's was a viable industry. The system is quite different compared to most gaming machines we know today because the Odyssey needs to take 6 C size Batteries underneath the unit in order to work. Also compare the controllers to what we are use to now. They used two dials to move your character dots and they were very awkward to say the least. Another weird thing about the Odyssey was that there is actually no power button here, the machine works only when you place one of the thin circuit cartridge keys in the system. Speaking of the games, the system only played Pong or odd search type games thanks to some interchangeable numbered circuit boards (these keys actually had no Read Only Memory or ROM) that would do some minor alterations to the system's already basic program. The games themselves had no score keeper, no colour, or no real options, so playing certain games are pretty much pointless unless you had one heck of a imagination. Some of the video games even came with goofy TV screen overlays to create a illusion of colour. Some title would also come with other weird things like cards, mats, poker chips, and even a light gun to improve the gaming experience but the games themselves are still rather simple to be any real fun and are definitely very limited to what we have today. The Magnavox Odyssey also had another huge problem and this is may be the reason why the system never really took off. The Odyssey was originally designed to only work on Magnavox only TV's. Sure, it will still work on most television sets but Magnavox didn't like the idea that it would be compatible with the competition out there. The company wasn't really prepared to market something so new or unusual back in the early 70's so there was a lot of confusion. Its actually surprising just how well the Odyssey did considering all these problems. Finding one of these beauties can also be very difficult because of its old age. It would be a good idea to not let it pass by if you manage to find one complete all you vintage collectors. Don't forget the Odyssey2 either. That was a cartridge based unit that features a built in keyboard and improved graphics. Although the Odyssey system only lasted two years before Magnavox pulled the plug (it's rumoured to have sold around 200,00 units), there is no denying this machine still paved the way for other companies to get into the business. Nintendo even sold Odysseys unit in Japan for Magnavox believe it or not. Although the Odyssey may be quite old especially when you're only controlling mere black and white dots, the machine will always have the bagging rights of being the first ever video game unit ever plus you have to admit that the Odyssey was the perfect name for the first video gaming system, eh? Rare scale: 7/10 good luck finding a complete set!